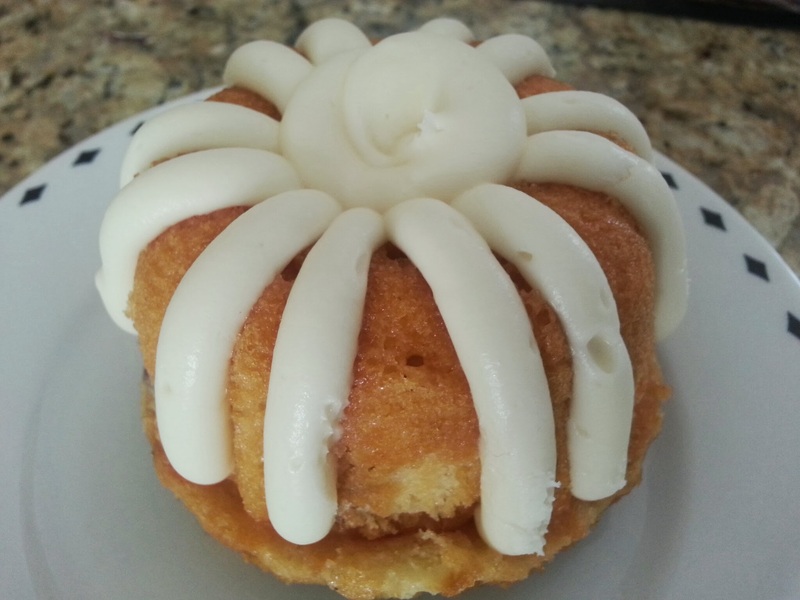 If you have never tried Nothing Bundt Cakes, you are definitely missing out! I first tried Nothing Bundt Cakes a couple years back when a store opened close to my house and they were offering a deal through Groupon. Those of you that know me know that I am the deals queen and I love my groupons! I was so impressed with the moistness and flavor of each individual cake, that they instantly became one of my favorites! Nothing Bundt Cakes began in 1997, started by long-time friends Dena Tripp and Debra Shwetz which both had a dream of becoming entrepreneurs. They spent 6 months putting together their special recipe that is now Nothing Bundt Cakes which are handmade fresh daily using real eggs, real butter, and real cream cheese. 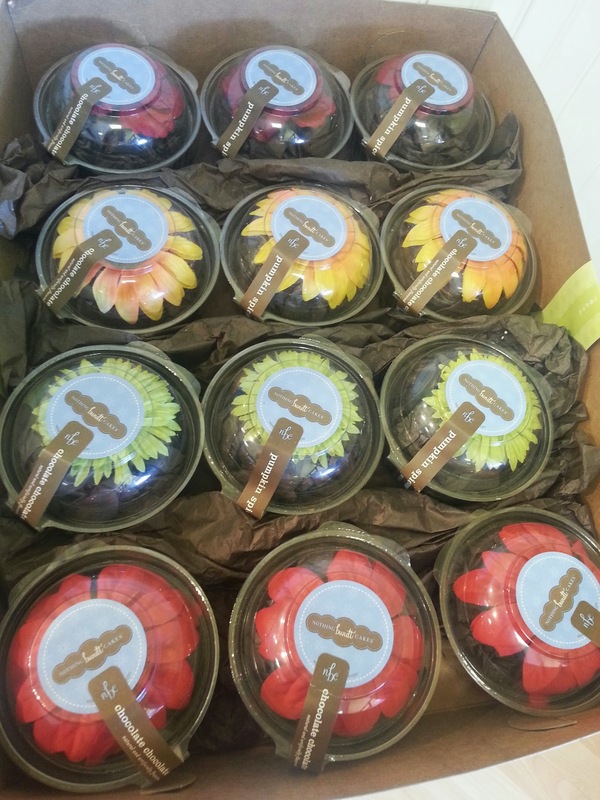 Nothing Bundt Cakes are able to be purchased in several different sizes to accommodate large and small groups. Cake sizes offered at Nothing Bundt Cakes include: bite-sized Bundtinis, single serving Bundtlets, and larger 8″ and 10″ cakes and even double-tiered cakes. In addition to cakes, there is also a fabulous assortment of gifts and decorations to help make any occasion more special. 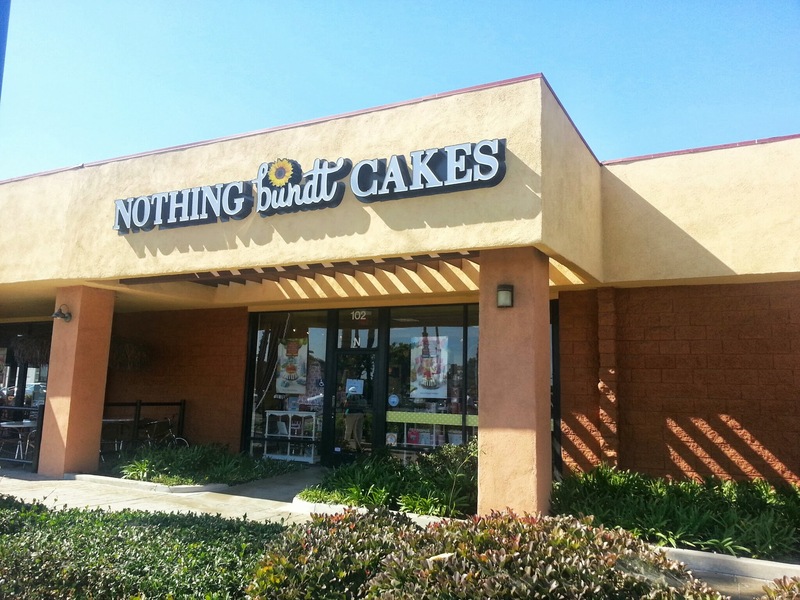 At a recent food event, I had the opportunity to meet the owner of the Huntington Beach Nothing Bundt Cakes location and she invited me in to check out her store. I was very pleasantly impressed. The store in Huntington Beach had a great variety of gift items, as well as greeting cards, and candles for birthday cakes. I was very happy to find it was a one stop shop for all your event planning needs! 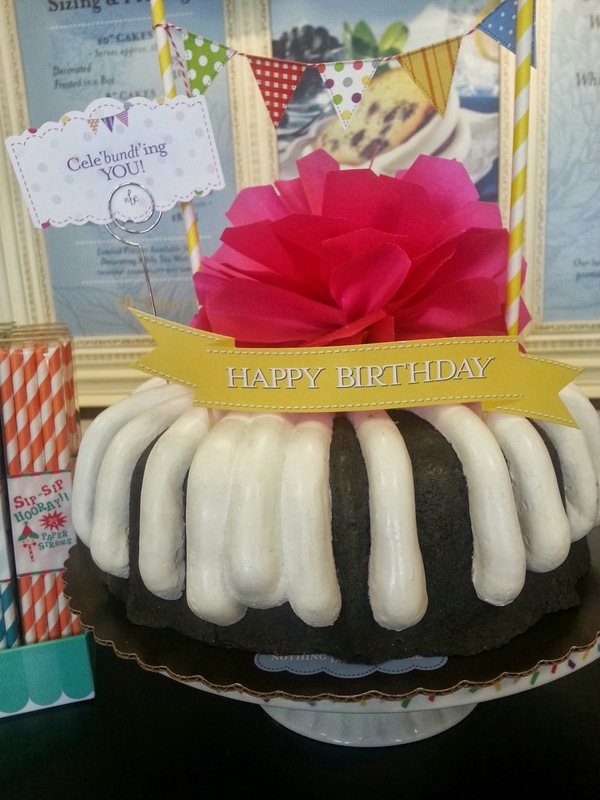 Nothing Bundt Cakes offers several different options for decorating their moist delicacies to cover any type of event from kid’s birthday parties to weddings to showers. There are definitely options for everyone when flipping through the books of ideas located on site. You can also have the opportunity to create your own design or to put together your own gift basket with all of the amazing merchandise you can buy in the store. 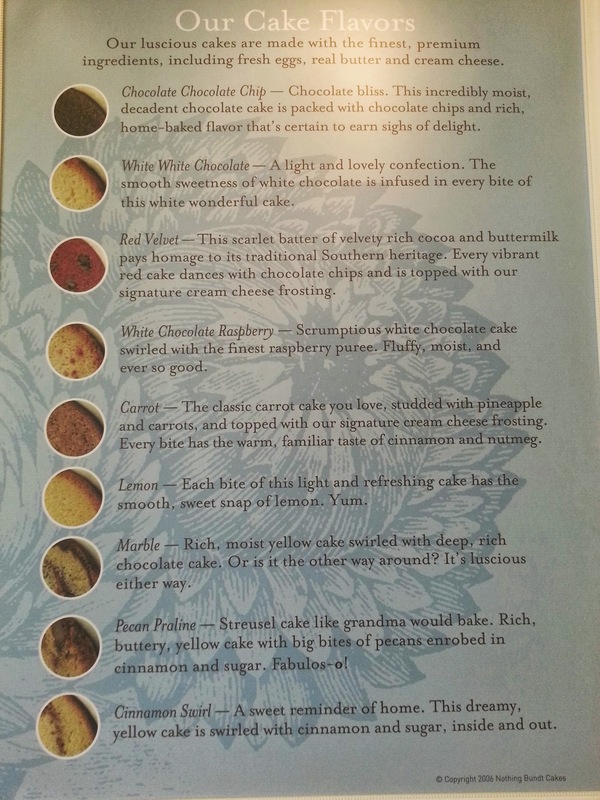 There are also some seasonal cake flavor options that are released yearly. One of those cake flavors was pumpkin spice, as can be seen in one of my pictures in this post. 🙂 I cannot wait to see what flavor they will release this year! 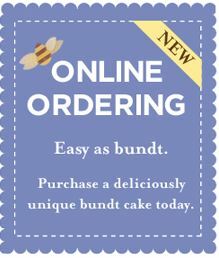 Something awesome that I personally love about Nothing Bundt Cakes is that you have the ability to put in your order online and pick it up at your convenience all ready to go without having to wait. 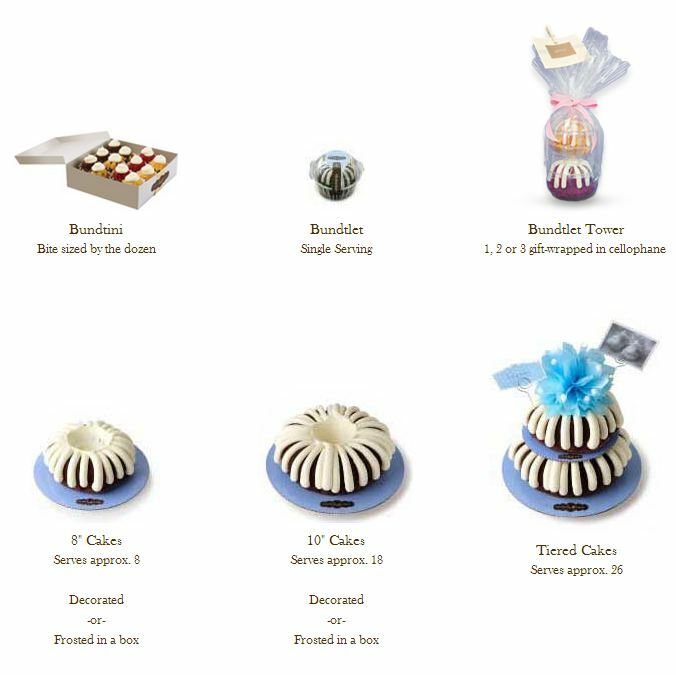 :) With 70 locations and 7 locations coming soon throughout the United States, Nothing Bundt Cakes is continuing to grow and you know you are getting a high quality product! I love these cakes! blog. I do not share or sell information and will use any information only for the purpose of contacting the winner.” In this giveaway you can win a 8 inch decorated cake that serves approximately 8 people. Retail value is $29.50, but you can win a gift card to get one FREE from the Nothing Bundt Cakes store in HUNTINGTON BEACH ONLY FOR FREE. Good luck my friends and let me know your thoughts about these awesome cakes below! I’ve had Nothing Bundt Cakes before, and my favorite flavor is Chocolate Chocolate Chip. I just recently had that one Chau:) It is very tasty..can never get enough chocolate! I’ve never had Nothing Bundt Cake but I hear the Red Velvet Cupcakes are devine! Oh yes! Lalita, you cannot go wrong with these cakes! I have no willpower against cake! My family loves Nothing Bundt Cakes! They have the most moist cakes. We actually just ordered a two tiered princess bundt cake in white chocolate raspberry from the District location. It’s our favorite flavor as well. I didn’t even know they had a blueberry one! Oh jeez, I didnt mean to write that twice! How embarrassing Lol.. I’ll have to go check out the blueberry! It sounds delish! I loved the peanut butter when they had it a couple months ago. No worries:) I never got to try the peanut butter one. I hope they bring it back! 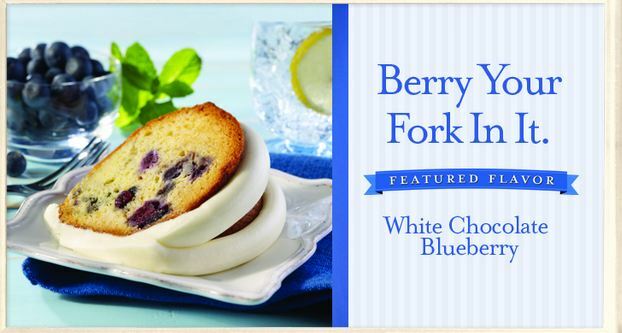 You will love white chocolate blueberry! OMG I haven’t had the opportunity to try but definetly on my to eat list! I did not see that they have a gluten free option.. I have never had a cake from nothing Bundt Cakes but I’ve been told by several people how yummy they are. I want to learn how to make these.. I have them a few times just never bothered to look up a great recipe!.. They look all so good! Wow! There’s blueberry. I didn’t know about this until I read this post. Thanks for sharing! I never heard of Bundt Cakes but they look yummy. Is the frosting low cal ? Nothing low calorie about these but all around super yummy…cream cheese rocks!! 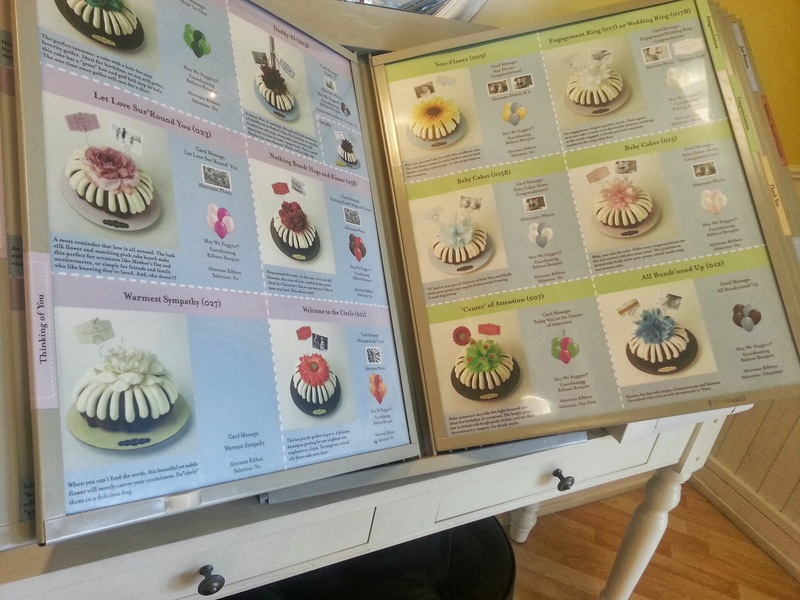 of tasting the variety of cake flavors at Nothing Bundt Cakes. theses are cute bundt cakes!!!! Oh my!!! All I need is a cup of tea and I am good to go!!!! For sure! Many yummy flavors! Super moist too! bundt cakes! its beautiful and delicious! While i do not think i ever tried one.. i like to eat cakes and they look really good! I’ve never tried nothing bundt cakes before.. I went to get one for a friends’ birthday and thought they were too over priced for my budget.. They are beautiful though.,. Wow they all look great and they make it super easy to order by ordering on line. I love that online ordering feature as well:) Thanks for the comment! 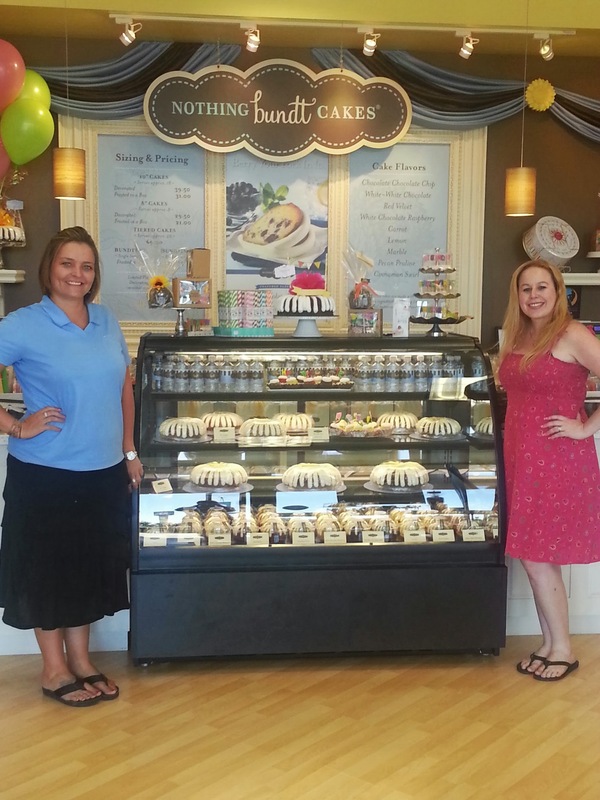 We have them here in Texas now and they are the best cakes and decorated great for any occasion. Oh my word, Dani you have my mouth watering. I haven’t had a piece of cake in over a year due to changing how I eat and dropping 54 pounds. But, I’m reading this post, looking at the pictures and rethinking my willpower at this moment…good thing this is in Huntington Beach and not down the street! These cakes look delicious! I wished I lived closer so I could enter your giveaway. Awww:) Thanks for the comment:) They are amazing cakes! I had the red velvet cake once and loved it!! I’ve never been there but may have to check it out next time I am in Huntington Beach visiting family! For sure:) It rocks:) Good luck in my contest! I have tried the red velvet, the marble, and the chocolate chocolate chip and they all are amazing in their own way! 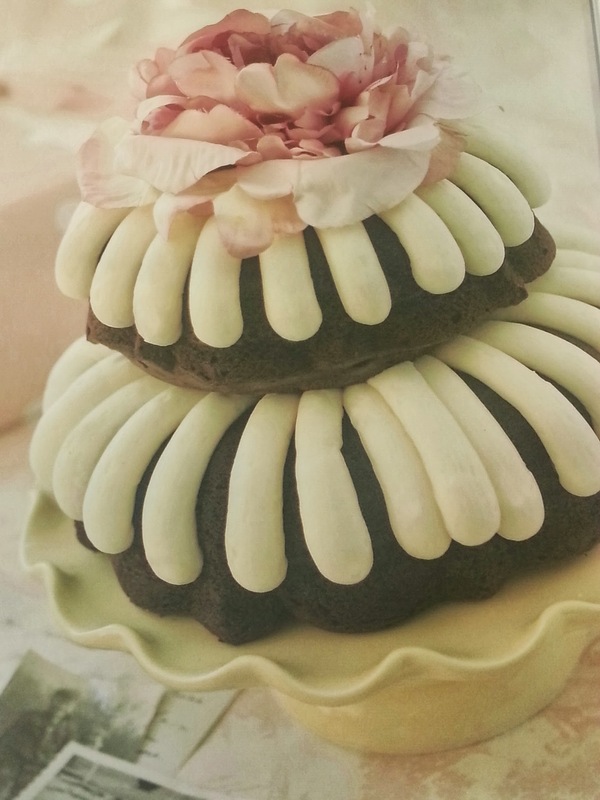 I love that they sell the baby bundts – perfect to share with my husband on date night! The pecan praline looks divine! I have tried the chocolate one and it was yummy! Red velvet or carrot cake for the win!!! Heard about it but never tried it! Would love chocolate chocolate chip cake! Commenting again in case the other one didn’t go through 😦 Would love to try chocolate chocolate chip but they all sound so good! 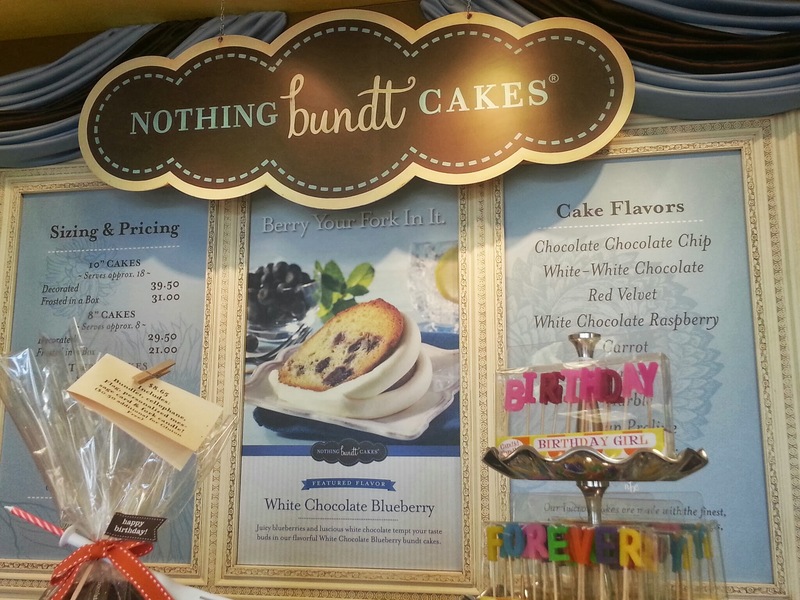 I’ve never tried their bundt cakes, but would definitely like to try their white chocolate raspberry. It sounds devine! I can’t wait for the Santa Clarita location to open so that I can visit the store in person, but until then I’ll do online ordering! I have never tried these but the Pecan Praline is making me drool. I havent had them but would like to try the lemon. I would love to try the red velvet!!! Looks so yummy! I have never tried one but I would love to try the Pecan Praline!